Onboard the world record holding Fjord Line Express HSC Fjord Cat you can expect an enjoyable trip in comfortable seats, a choice of meals at any time of day and numerous bargains in the tax free shop. 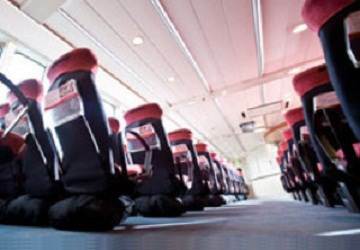 The Fjord Cat can carry up to 900 passengers and 220 cars, though Fjord Line restrict this to under 700 passengers and 180 cars to ensure you have plenty of space onboard. The HSC Fjord Cat holds the world record for the fastest crossing of the Atlantic Ocean. Set in 1998, with an average speed of around 76kph (41 knots), she was the first ship to cross the Atlantic in less than three days. 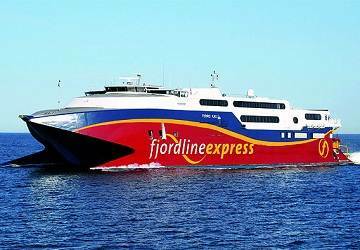 As the Fjord Line Express Cat has a cruising speed much faster than other ferries, be sure to wave at other ships as you overtake them on your way to Norway or Denmark! Onboard you’ll find 2 different classes of reserved seating. 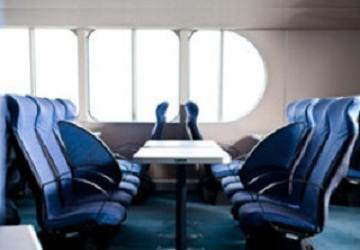 In the large lounge on deck 2 you’ll find basic airplane style seats which are included in the ticket price. For travellers who want a comfortable lounge with comfortable seats around a table then upgrade to the ‘Comfort’ option (grouped in four, six and eight seats around a table). You also have the choice of adding an all-inclusive buffet to the ‘comfort’ seating option. The buffet table is available up to 30 minutes before arrival and includes mineral water, beer, wine and coffee (no beer / wine included in the breakfast). The Fjord Cat features a self-service restaurant offering breakfast, lunch and dinner. The classic breakfast buffet provides a good start to the day while the lunch table offers a selection of both hot and cold dishes, cakes and coffee. The dinner buffet offers a wide selection of hot and cold dishes to suit every taste and there’s also a salad bar and dessert table. 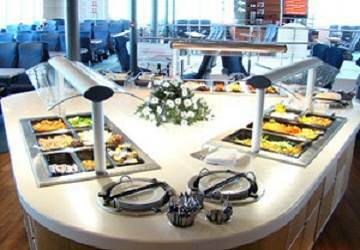 In addition to the self service restaurant there is a café on deck 2 and a kiosk on deck 3 selling hot dogs, ice cream, sandwiches and beverages. 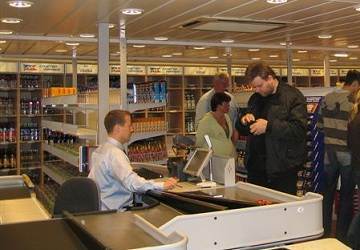 You can buy all sorts of things in the tax free shop onboard the Fjord Cat including cosmetics, clothing, perfumes, aftershave, sweets, chocolates, games and travel essentials. Mobile phone coverage is provided onboard (once at sea) by Maritime Communications Partner (MCP). The service is charged via your home operator at a rate similar to international rates. If assistance will be required before, during or after your trip then it is advised to let us know at time of booking and subsequently you should inform Fjord Line staff at check-in. There are no lifts on the Fjord Line Express Fjord Cat and therefore wheelchair bound passengers will not have access to the ‘comfort class’ seating lounge (only accessible by staircase). Please Note: Whilst we have taken great care in making our Fjord Cat guide as accurate as possible, onboard facilities, services and entertainment may vary depending on the date and time of year that you travel, facilities mentioned may change without notification and ferry companies reserve the right to operate vessels other than those mentioned at time of booking without prior notification. 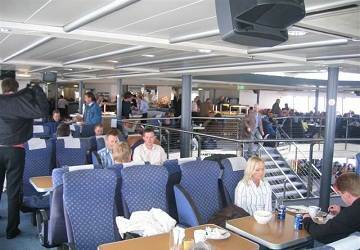 "Great ship, staff and organisation too"
Can't say too much about the food on board, but we weren't there to eat. I can say that the quality of the welcome from the staff when we got on the fjord cat was excellent.. Ship was also very clean. All in all, the trip went really well. "Really cool trip with our motorbikes"
Our crossing was slightly scuppered by the bad weather and we had nearly an hour delay, but that's life! The only complaint I have is that we got no help to secure our bike and a lot of riders do not know how to use the straps provided to them on ferries ... in bad weather it poses risks to everyone. The staff who organise and arrange the cars could be a little more cooperative and willing to help. This remark does not apply to the rest of the crew who were awesome. We travelled with the motorcycle, and even if it is often a big sacrife, sometimes is a privilege like during this journey. So I really want to thank all the staff and the company that in a rainy day, treated us really well.